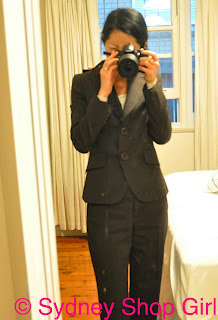 Sydney Shop Girl: My day in a suit. Hello Kitty II. Random reminisces. 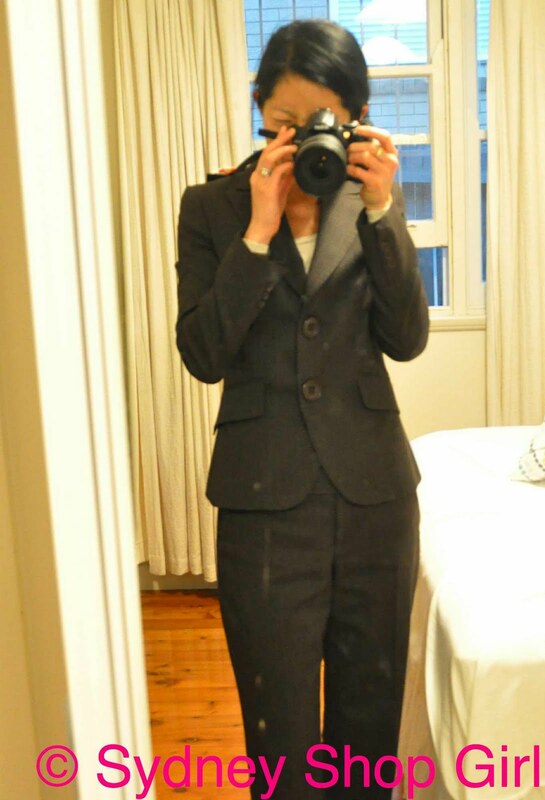 My day in a suit. Hello Kitty II. Random reminisces. Yes, that's me. In front of a dirty mirror (apologies, will get around to cleaning it when I'm On Annual Leave The Week After Next), wearing a suit. It was a hard day at work. I had to wear a suit, I had to give a presentation (last billing on a Friday afternoon, it's a tough crowd, I'm telling you), I had to wear daggy shoes on account of my swollen left foot I've developed and still do my regular day job minus my resident (junior who does the paper work and the talking I can't bear to do - joke). I tell you, a lesser woman would have used another day of accrued sick leave and retreated to the lounge with a DVD, some chick lit and all the stuff she'd IQ'd. It was very tempting. I am really keen on Economy Gastronomy at the moment. It's common sense, tasty frugality. My initial interest in Masterchef is waning. They must have onions on set 24/7 because there just seems to be so many spontaneus tears already in the season. If this suit could talk. It's Veronika Maine (before they stopped being Cue for Old Women With Real Lives and concentrated on dresses in quirky shapes and fabrics, Cue For Old Women Who Are Disciples of Deconstruction). It's a wool blend affair that has done it all - clinical exams, the pants get a fair work out in winter as a foundation for winter work outfits and the combo has even been to drinkies at Bulgari's Sydney store Christmas do. That was the random event to end all random events. There was a huge wheel of parmesan from which chunks were being carved off and platters of prosciutto. With champagne of course. Under the watchful eye of walls of handbags, scarves and jewellery. 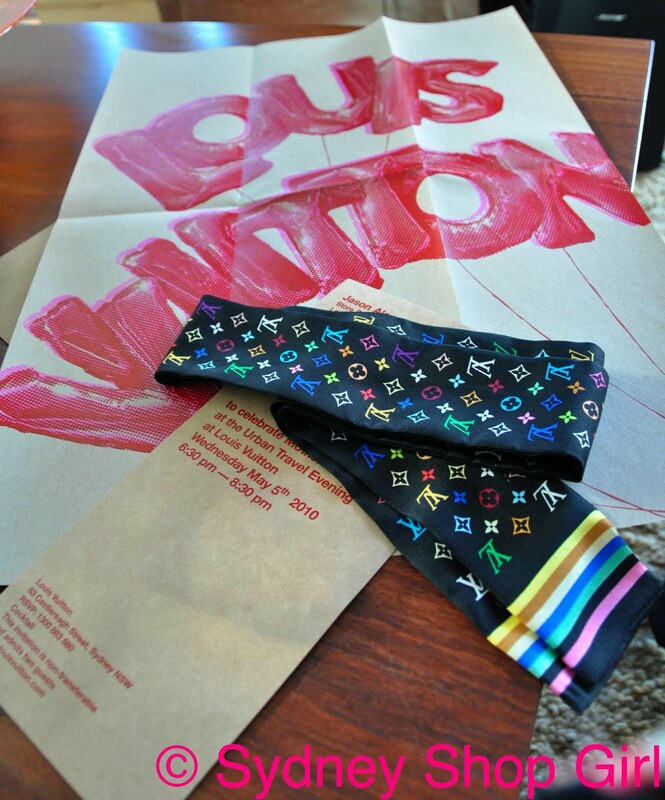 Out of all the people I should bump into at there, but my favourite SA from Louis Vuitton Perth! She had jumped ship, come home to Sydney and now works for Bulgari. It was pretty surreal and a whole lot of fun. Louis Vuitton are holding an Urban Travel Evening next week and my guest and I are Unable To Attend. Because I'm going to be on the Sunshine Coast, delivering another rivetting Powerpoint presentation that very same day, possibly in my sturdy brown suit. There is something strangely compelling about customer events at the House of Vuitton. Actually, not that strange when you remember that LVMH owns Moet Chandon. Crab sandwiches and endless glasses of Moet are not a bad way to spend an evening. Except when you have to negotiate the stairs at the Castlereagh store. The fruits of the SSG Urban Travel Evening. The Hello-Kittying of my backpack. My second H-Kitty arrived from eBay Land. She's the one on the left. Mr SSG calls this overkill and is questioning my chronological age but I remain loud and proud in my love of the H-Kitty. 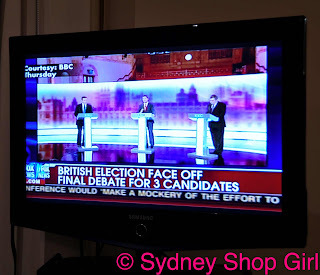 I've been following the British election campaign on the radio and caught the last debate on Fox this evening. I think the grass is always greener. Somehow I always come away from these debates in awe of those elusive politicians from across the seas who actually answer questions directly in plain English. I felt the same about the US elections. 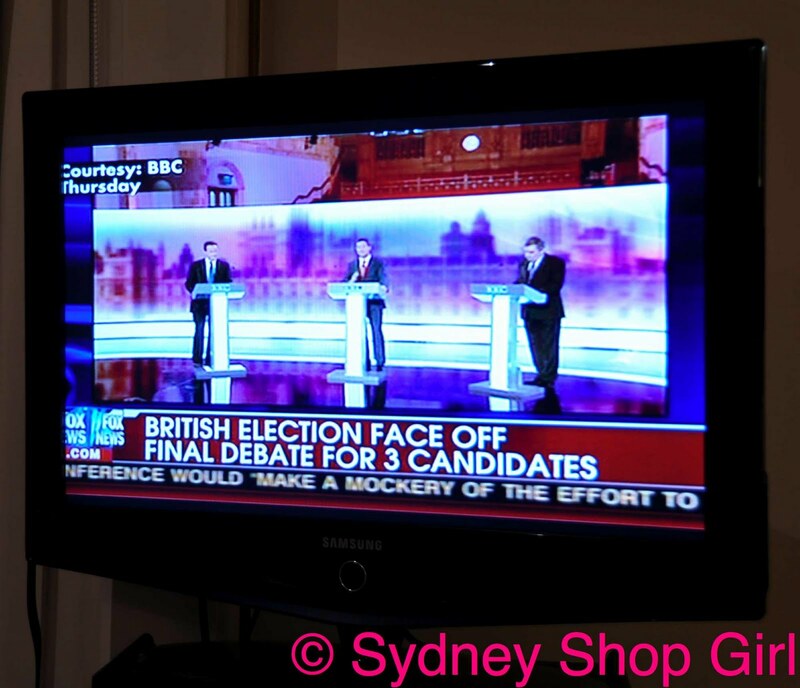 Perhaps British and American observers of Australian politics feel the same way. It's very remote perhaps, but a perhaps all the same. Nothing else to report tonight. The weekend promises to be interesting - photgraphy in The Rocks and a session as a pupil in yoga teacher (or as Mr SSG calls them, the Yoga Yodas) exams. In between, Ill be checking the stitches on my foot. I wonder if they'll hold up for a run tomorrow? I am curious now SSG - what industry is your day job in? I'm in health by day. SSG- I thought you were in a SHOP! LOL, I guess the SHop girl part is you shopping ! Hope that foot is on the mend! 1. Thanks for the comments. 2. I also work in the healthcare field. 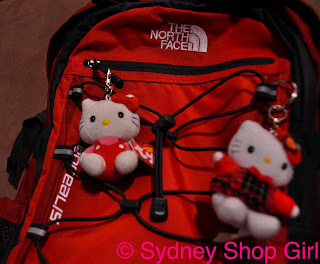 I'm completely with you on the Hello Kitty idolatry. Love the suit. I dont wear suits much at all now. Once a year.